This article is about the scrolling video game genre. For the related genre for one-on-one combat, see fighting game. For the Iggy Pop album, see Beat 'Em Up. "Brawler" redirects here. For the 2011 American film, see Brawler (film). For the 2017 Indian film, see The Brawler. "Brawlers" redirects here. For the English punk rock group, see Brawlers (band). Beat 'em up (also known as brawler) is a video game genre featuring hand-to-hand combat between the protagonist and an improbably large number of opponents. Traditional beat 'em ups take place in scrolling, two-dimensional (2D) levels, though some later games feature more open three-dimensional (3D) environments with yet larger numbers of enemies. These games are noted for their simple gameplay, a source of both critical acclaim and derision. Two-player cooperative gameplay and multiple player characters are also hallmarks of the genre. Most of these games take place in urban settings and feature crime-fighting and revenge-based plots, though some games may employ historical, science fiction or fantasy themes. The first beat 'em up was 1984's Kung-Fu Master, with 1986's Renegade introducing the urban settings and underworld revenge themes employed extensively by later games. The genre then saw a period of high popularity between the release of Double Dragon in 1987, which defined the two-player cooperative mode central to classic beat 'em ups, and 1991's Street Fighter II, which drew gamers towards one-on-one fighting games. Games such as Streets of Rage, Final Fight, Golden Axe and Battletoads are other classics to emerge from this period. The genre has been less popular since the emergence of 3D-based mass-market games, but still some beat 'em ups adapted the simple formula to utilize large-scale 3D environments. Beat 'em ups, such as Streets of Rage 2, feature combat against multiple antagonists, often taking place on modern city streets. A beat 'em up (sometimes also called "brawlers") is a type of action game where the player character must fight a large number of enemies in unarmed combat or with melee weapons. Gameplay consists of walking through a level, one section at a time, defeating a group of enemies before advancing to the next section; a boss fight normally occurs at the end of each level. However arcade versions of these games are often quite difficult to win, causing players to spend more money. Beat 'em ups are related to—but distinct from—fighting games, which are based around one-on-one matches rather than scrolling levels and multiple enemies. Such terminology is loosely applied, however, as some commentators prefer to conflate the two terms. At times, both one-on-one fighting games and scrolling beat 'em ups have influenced each other in terms of graphics and style and can appeal to fans of either genre. Occasionally, a game will feature both kinds of gameplay. In the United Kingdom, gaming magazines of the early 90s such as Mean Machines and Computer & Video Games (C+VG) refereed to all games which had a combat motif as beat 'em ups, even the fighting games. However, they were differentiated by a specific prefix and so games like Double Dragon or Final Fight were called "scrolling beat 'em ups" and games such as Street Fighter II or Mortal Kombat were referred to as a "one on one beat 'em ups". Beat 'em up games usually employ vigilante crime fighting and revenge plots with the action taking place on city streets, though historical and fantasy themed games also exist. Players must walk from one end of the game world to the other, and thus each game level will usually scroll horizontally. Some later beat 'em ups dispense with 2D-based scrolling levels, instead allowing the player to roam around larger 3D environments, though they retain the same simple gameplay and control systems. Throughout the level, players may acquire weapons that they can use as well as power-ups that replenish the player's health. As players walk through the level, they are stopped by groups of enemies who must be defeated before they're able to continue. The level ends when all the enemies are defeated. Each level contains many identical groups of enemies, making these games notable for their repetition. In beat 'em up games, players often fight a boss—an enemy much stronger than the other enemies—at the end of each level. Beat 'em ups often allow the player to choose between a selection of protagonists—each with their own strengths, weaknesses, and set of moves. Attacks can include rapid combinations of basic attacks (combos) as well as jumping and grappling attacks. Characters often have their own special attacks, which leads to different strategies depending on which character the player selects. The control system is usually simple to learn, comprising as little as two buttons. These buttons can be combined to pull off combos, as well as jumping and grappling attacks. Since the release of Double Dragon, many beat 'em ups have allowed two players to play the game cooperatively—a central aspect to the appeal of these games. Beat 'em ups are more likely to feature cooperative play than other game genres. The first game to feature fist fighting was Sega's boxing game Heavyweight Champ (1976), which is viewed from a side-view perspective like later fighting games. However, it was Data East's fighting game Karate Champ (1984) which popularized martial arts themed games. The same year, Irem's Hong Kong cinema-inspired Kung-Fu Master (known as Spartan X in Japan) laid the foundations for side-scrolling beat 'em ups with its simple gameplay and multiple enemies. Also in 1984, Bruce Lee combined multi-player, multi-character combat with traditional collecting, platform and puzzle gameplay. Later that year, Karateka combined the one-on-one fight sequences of Karate Champ with the freedom of movement in Kung-Fu Master, and it successfully experimented with adding plot to its fighting action. It was also among the first beat 'em ups to be successfully ported to home systems. Nekketsu Kōha Kunio-kun, released in 1986 in Japan, deviated from the martial arts themes of earlier games and introduced street brawling to the genre. 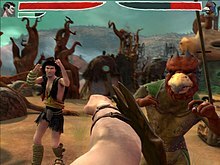 The Western adaptation Renegade (released the same year) added an underworld revenge plot that proved more popular with gamers than the principled combat sport of other games. Renegade set the standard for future beat 'em up games as it introduced the ability to move both horizontally and vertically. It also introduced the use of combo attacks; in contrast to earlier games, the opponents in Renegade and Double Dragon could take much more punishment, requiring a succession of punches, with the first hit temporarily immobilizing the enemy, making him unable to defend himself against successive punches. In 1987, the release of Double Dragon ushered in a "Golden Age" for the beat 'em up genre that lasted nearly five years. The game was designed as Technōs Japan's spiritual successor to Renegade, but it took the genre to new heights with its detailed set of martial arts attacks and its outstanding two-player cooperative gameplay. Double Dragon's success resulted in a flood of beat 'em ups that came in the late 1980s, where acclaimed titles such as Golden Axe and Final Fight (both 1989) distinguished themselves from the others. Final Fight was Capcom's intended sequel to Street Fighter (provisionally titled Street Fighter '89), but the company ultimately gave it a new title. In contrast to the simple combo attacks in Renegade and Double Dragon, the combo attacks in Final Fight were much more dynamic, and the sprites were much larger. Acclaimed as the best game in the genre, Final Fight spawned two home sequels and was later ported to other systems. Final Fight was also the reason for Capcom's new found fame and for Technos Japan's bankruptcy. Golden Axe was acclaimed for its visceral hack and slash action and cooperative mode and was influential through its selection of multiple protagonists with distinct fighting styles. It is considered one of the strongest beat 'em up titles for its fantasy elements, distinguishing it from the urban settings seen in other beat 'em ups. Bad Dudes Vs. DragonNinja featured platform elements, while P.O.W. : Prisoners of War took the weapon aspect a stage further, allowing the players to pick up guns. Another beat 'em up—River City Ransom (1989), named Street Gangs in Europe—featured role-playing game elements with which the player's character could be upgraded, using money stolen from defeated enemies. The Streets of Rage series was launched in the early 1990s and borrowed heavily from Final Fight. Streets of Rage 2 for Sega's Mega Drive was notable for being one of the first console games to match the acclaim of arcade beat 'em ups. Its level design was praised for taking traditional beat 'em up settings and stringing them together in novel ways, and its success led to it being ported to arcades. The beat 'em up was also a popular genre for video games based on television series and movies, with Teenage Mutant Ninja Turtles and Batman Returns a surprise success, and encouraged many more beat 'em up games based on the characters. However, the "golden age" of the genre ended in the wake of the success of Capcom's Street Fighter II (1991), which drew gamers back towards one-on-one fighting games, while the subsequent emerging popularity of 3D video games diminished the popularity of 2D-based pugilistic games in general. By the mid-1990s, the genre suffered from a lack of innovation. Core Design's Fighting Force (1997) was anticipated to redefine the genre for 32-bit consoles through its use of a 3D environment. However, it was met with a lukewarm reception. The Dynasty Warriors series, beginning with Dynasty Warriors 2 in 2000, offered traditional beat 'em up action on large 3D battlefields, displaying dozens of characters on the screen at a time. The series to date spans 14 games (including expansions) which players in the West view as overly similar, although the games' creators claim their large audience in Japan appreciates the subtle differences between the titles. While critics saw Dynasty Warriors 2 as innovative and technically impressive, they held a mixed opinion of later titles. These later games received praise for simple, enjoyable gameplay but were simultaneously derided as overly simplistic and repetitive. In 2000, Italian studio NAPS team released Gekido: Urban Fighters for the PlayStation console, which uses a fast paced beat 'em up system, with many bosses and a colorful design in terms of graphics. Another best-selling Japanese series, Yakuza, combined elaborate plots and detailed interactive environments with street brawling action. Despite these releases, game reviewers started to pronounce that the genre had died off. By 2002, there were virtually no new beat 'em ups being released in arcades. Capcom's Viewtiful Joe (2003) used cel-shaded graphics and innovative gameplay features (such as the protagonist's special powers) to "reinvigorate" its traditional 2D scrolling formula. The Behemoth's Castle Crashers (2008) also featured cartoon graphics, quirky humor, and acclaimed cooperative gameplay. Rockstar Games' The Warriors (based on the 1979 movie of the same name), released in 2005, featured large scale brawling in 3D environments interspersed with other activities such as chase sequences. The game also featured a more traditional side-scrolling beat 'em up Armies of the Night as bonus content, which was acclaimed along with the main game and was later released on the PlayStation Portable. Releases such as God Hand in 2006 and MadWorld in 2009 were seen as parodies of violence in popular culture, earning both games praise for not taking themselves as seriously as early beat 'em up games. Classic beat 'em ups have been re-released on services such as the Virtual Console; critics reaffirmed the appeal of some, while the appeal of others has been deemed to have diminished with time. Although the genre lacks the same presence it did in the late 1980s, some titles such as Viewtiful Joe and God Hand kept the genre alive. After 2000, the beat 'em up genre has seen a revival in the form of popular 3D hack and slash games in the style of Devil May Cry (2001 onwards), including Ninja Gaiden (2004 onwards), God of War (2005 onwards), Heavenly Sword (2007), Afro Samurai (2009), and Bayonetta (2009). Several traditional 2D scrolling beat 'em ups have also been released in recent years, including Scott Pilgrim vs. the World: The Game (2010). The popular Grand Theft Auto series also has elements of the beat 'em up genre.. Saints Row IV (2013) featured a parody of Streets Of Rage entitled "Saints Of Rage", where the player rescues Johnny Gat from a virtual prison. ^ Hawken, Kieren (16 February 2017). "The A-Z of Atari 2600 Games: Volume 1". Andrews UK Limited. Retrieved 2 March 2018 – via Google Books. ^ "First side-scrolling beat-em-up". Guinness World Records. Retrieved 2 March 2018. ^ Davis, Ryan, The Hulk (Xbox), CNET, May 5, 2003. Retrieved March 24, 2009. ^ Ellis, David, MadWorld Review for the Wii Archived 2009-03-26 at the Wayback Machine, 1UP, March 10, 2009. Retrieved March 24, 2009. ^ Anon. (May 3, 2006). "E3 Feature: Fighting Games Focus". Edge. Future plc. Retrieved 2015-01-11. ^ Wales, Matt, Super Smash Bros. Brawl UK Review, IGN, June 8, 2008. Retrieved March 24, 2009. ^ "Final Fight – Super Nintendo – Mean Machines review". Meanmachinesmag.co.uk. Retrieved 2018-01-09. ^ a b c d e Cassidy, William, Hall of Fame: Golden Axe Archived 2009-08-18 at the Wayback Machine, GameSpy, June 8, 2003. Retrieved March 24, 2009. ^ Fudge, James, X-Men: The Official Game Archived December 30, 2008, at the Wayback Machine, Xploder June 13, 2006. Retrieved March 24, 2009. ^ Ramachandran, Ryan, Gamasutra Opinion: Boss Design – Trial & Punishment, GamaSutra, June 17, 2008. Retrieved March 24, 2009. ^ Staff, Game Help Editors' Picks Co-Op Games, IGN, June 13, 2005. Retrieved March 24, 2009. ^ Cifaldi, Frank, The Quantum Leap Awards: The Most Important Multiplayer Games of All Time, GamaSutra, Feb 2, 2007. Retrieved March 24, 2009. ^ "Bruce Lee review". CRASH (16). May 1985. Retrieved 2007-09-26. ^ Edgely, Clare (May 1985). "Spectrum Software Scene 2". Sinclair User (38). Archived from the original on 2007-11-05. Retrieved 2007-09-26. ^ Evolution of a Genre: Beat 'Em Ups, ABC Television, Nov 6, 2007. Retrieved March 24, 2009. ^ a b Jess Ragan (2006-06-15). "Playing With Power". 1UP.com. p. 3. Archived from the original on 2012-07-18. Retrieved 2011-02-25. ^ "TMNT Games". 1up.com. Archived from the original on 2012-07-17. Retrieved 2009-03-26. ^ Arnold Katayev (2009-01-31). "Afro Samurai Review". PSX Extreme. Archived from the original on 2011-07-15. Retrieved 2011-02-26. ^ Jeff Bakalar, Scott Stein and Dan Ackerman (January 4, 2010). "Bad hair day: Bayonetta hands-on". Retrieved 2011-02-26. ^ Chris Kohler (July 22, 2010). "The Gamer's Guide to Comic-Con 2010". Wired. Retrieved 2011-02-26. This page is based on the Wikipedia article Beat 'em up; it is used under the Creative Commons Attribution-ShareAlike 3.0 Unported License (CC-BY-SA). You may redistribute it, verbatim or modified, providing that you comply with the terms of the CC-BY-SA.